With permission of the copyright holder -the author -to whom copyright reverted one year after publication. Minority business set-asides were created as a prophylactic measure to redress discrimination against minority owned business firms. Predominantly minority jurisdictions found them especially attractive because they promised to provide minority firms a share of the procurement dollars expended by these jurisdictions. The Croson decision invalidated Richmond’s ordinance and posed substantial barriers to further enactments. This article proposes an alternative to such set-aides. It argues that the proposed alternative, an Equal Opportunity Rating Agency (EORA), provides a superior business development policy tool and does not have the constitutional vulnerabilities of set-asides. An EORA would operate much like a credit rating agency, although instead of rating a borrower’s likelihood of debt repayment, it would instead estimate the ability of local government contractors to perform a nondiscrimination obligation imposed by procurement contracts. Since, as with credit ratings, the most probative evidence of credit worthiness is a past history of debt repayments, the most persuasive evidence of the ability to perform a nondiscrimination obligation would be a prior history of fair dealings with minority firms, based upon their presence and size in the relevant markets. A bidder would receive the highest rating for its private sector transactions with minority firms. The information required to compile credit ratings comes from credit applicants, the accuracy of which is tied to loan covenants. Similarly, bid applications would require contractors to submit their prior history of transactions with minority firms. Inaccurate or fraudulent information would result in contractual penalties and barriers to future contracts. Nondiscrimination obligations applicable to private commercial transactions are not currently imposed on government contractors. Current contractual nondiscrimination obligations are limited to employment. Nondiscrimination obligations in government procurement contracts would harness market competition to inhibit discrimination in private business to business transactions. Contractors would compete with respect to their ability to perform this obligation. Those with the best ratings would have a competitive advantage in government procurement, just as those with excellent credit ratings can borrow at lower costs and on more favorable terms. This approach offers certain policy advantages. Unlike set-asides which allocate to minority firms a portion of a government contract and apply only to the narrow range of goods and services that governments buy, (mostly construction services), and often in unwieldy amounts, this approach would potentially open all industries and apply to a broad continuum of contract sizes on which even small and inexperienced minority firms might cut their teeth. By imposing the nondiscrimination obligation on both minority and non minority contractors and subcontractors, it would operate in a race neutral manner. If a local government can exclude a bidder from consideration because of an inadequate record of operating experience or poor finances, factors lacking constitutional significance, it can exclude bidders with suspect ability to perform a constitutionally favored nondiscrimination obligation. 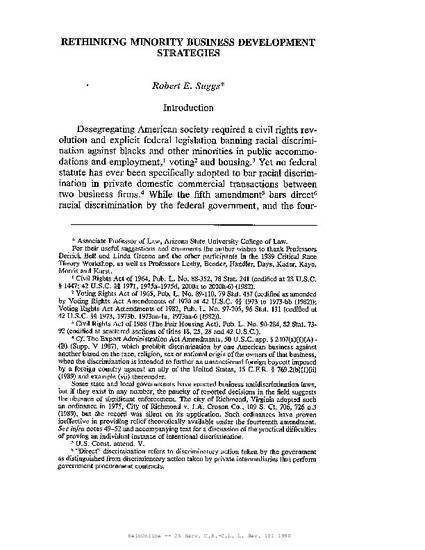 25 Harvard Civil Rights-Civil Liberties Law Review 101 (1990).